That knowledge has led Matsushita Electric Works to develop two new light fittings that are specially designed not to attract insects. 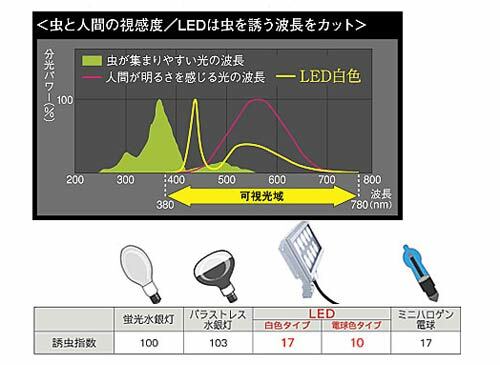 The lamps are intended for commercial premises, which explains why they cost ¥262,500 ($2,600). The unnamed gear comes in two bulb colours (white and warm yellow) and uses LEDs instead of typical fluorescent tubes to reduce both ultraviolet emissions and power consumption. With a 60 per cent cut in power usage and two thirds fewer dead bugs splattered over them, the new lamps are sure to win favour with both penny pinchers and entomologists.